The new Joker is ready to party. Zendaya talks about those Little Mermaid rumors. The third Kingsman movie could be dropping next year. Matt and Foggy host an uneasy reunion in the first pictures from Daredevil’s third season. Plus, what’s to come on Riverdale, Halloween goes documental, and the world of Instagram teases who’s back for Avengers 4. Spoilers, go! Fliers for Thomas Wayne’s mayoral campaign have been spotted on set. We also have a clapperboard baring the film’s logo. 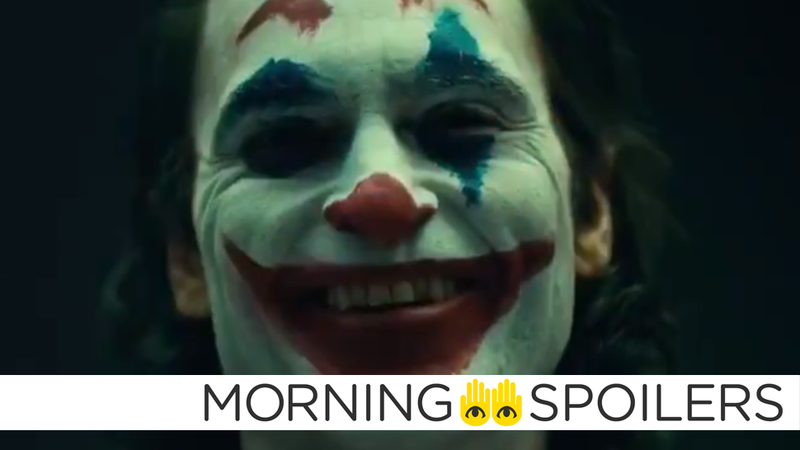 Regarding the other Joker movie, co-director Glenn Ficcara revealed to Metro the story begins with Harley Quinn kidnapping the infamous Dr. Phil (pending a guest appearance by the actual Dr. Phil). It is great. The whole thing starts with Harley kidnapping Dr Phil. Played by Dr Phil hopefully. Because her and the Joker are having problems with their relationship. We had so much fun, I don’t know if we have had more fun writing a script in our career. It was sort of like, we wrote Bad Santa a couple of years ago, and it was that sensibility mixed with our This Is Us sensibility. We kind of meshed them together. We were doing a relationship movie but with the sensibility of a Bad Santa, f***ed up, mentally deranged people. It was a lot of fun. In conversation with Variety, Zendaya stated she has not signed on to play Ariel in The Little Mermaid, but answered “I mean, yeah, why wouldn’t I?” when asked if she was interested. Several Instagram stories collected by The Wrap indicate Tessa Thompson is now in Atlanta with Chris Hemsworth to film additional scenes as Valkyrie. A separate Instagram post reveals Benedict Wong is already on set...getting a brand new set of hair? The final trailer for Halloween takes the form of a true crime documentary. Bloody-Disgusting has exclusive photos from Bad Robot’s supernatural WWII movie which our own Germain Lussier just reviewed from Fantastic Fest. More at the link. A new TV spot from Japan sells the hell out of the Aquaman movie. The latest TV spot has fun with additional text. Exhibitor Relations has revealed the third Kingsman movie is slated for a November 8, 2019 release date. Interested parties who frankly don’t know any better can now stream Eminem’s theme song below. Katherine McNamara (Shadowhunters) will appear in “the first half of season seven” as Maya, “a scrappy street fighter and thief from Star City.” TV Line notes the character’s initial (though unofficial) casting notice likens her to “Buffy the Superhero Slayer.” Rude to tarnish Buffy’s reputation like that, honestly. That Hashtag Show has a casting call for Margaret “Magpie” Pyle, the curator-turned-criminal obsessed with shiny objects. Female of any ethnicity in her 30's. Dressed in black with a quirky attitude, Magpie is a misfit and a thief who is insanely in love with shiny objects. Things get intense when Magpie decides to steal from The Penguin. Good news! DuckTales has been renewed for a third season ahead of its season two premiere. Enjoy David Tennant’s beleaguered despair at attempting to work with his international colleagues below. In a recent interview with Entertainment Weekly, Jeph Loeb stated Iron Fist has yet to be renewed for a third season at Netflix. Speak to our friends at Netflix. Unlike the movie studio, which can announce a Captain Marvel movie will be out in 2019, the television studio will always be beholden to our networks, and so if our networks want another season of Iron Fist, we’re ready to go. We’re just waiting for the answer. ...all we’ve ever said is that there are no plans right now [to do more]. It doesn’t mean that it’s off the table. And it doesn’t mean that it even has to be with the original characters that were in the first Defenders. The CW has released an official synopsis for season three. AND THE VERDICT IS... As the jury begins deliberations in his murder trial, Archie (KJ Apa) makes a surprising request about how he wants to spend his final days of summer. Betty (Lili Reinhart) is forced to deal with her problems head-on after a heated confrontation with Alice (Madchen Amick) and Polly (guest star Tiera Skovbye) brings up some dark secrets she’s kept hidden. Matt reunites with Foggy in two new pictures from Entertainment Weekly.